In a large skillet over medium heat, melt the butter. Add the onions and bay leaf and cook, stirring occasionally, until tender and browned, 20-25 minutes. Push the onions to the side of the pan and increase the heat to high. Add the chicken livers to the center of the pan and cook until browned, then stir in the onions and season with the thyme, salt and pepper. Discard the bay leaf. In a food processor, puree the liver and onions until smooth. Pack into a crock and serve warm or cool (press a piece of plastic wrap directly onto the surface of the spread if not serving immediately). Serve with the bread and garnishes. In Recipes-list.com we have selected the most viewed recipes from category - uncategorized . Enjoy the best recipes specially selected for you! 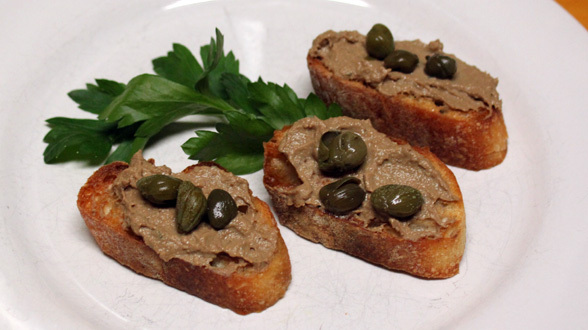 Mama Elsa’s Chicken Liver Spread is the right choice that will satisfy all your claims.